Buy compression springs in Las Vegas, Nevada by buying your springs from Acxess Spring. We are located in the city of Colton, California; making us the nearest wire spring company. Acxess Spring company was founded in the year of 1996 by Alfonso Jaramillo Jr. Alfonso had extensive experience in the spring industry by working for some of the biggest spring companies in the United States. Alfonso went out and started a completely different kind of spring company using technology to help serve his customers better. Bridging the gap between spring knowledge, spring design giving the customer a more fluid education of the spring world. 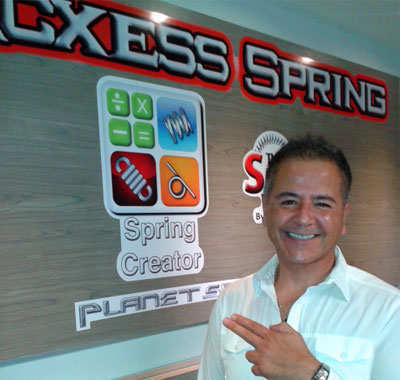 Alfonso Jaramillo Jr, built The Spring Store, Spring Creator, Spring Finder and Instant Spring Quote to help his customers when they need it, instantly. Acxess Spring has helped thousands of companies worldwide with their spring needs. We are proud to say that, not only are we a 20 year old company, but we also have over 40 years of experience leading us in the designing and manufacturing of your coiled wire springs. Being that we are the closest spring company to the state of Nevada, Acxess Spring is the best option since its location is in Colton, California. At Acxess Spring we work with many out of state companies; some coming from Nevada; including Nevada’s capital city, Carson City as well as Las Vegas. With both of our websites; AcxesSpring.com and TheSpringStore.com, we are able to provide las vegas manufacturers with both custom and stock coil springs. Our sites are very useful to the user since they are filled with technical articles which can help you with your spring design for a variety of spring types including compression spring designs, extension spring designs, torsional spring designs, conical spring designs, magazine spring designs, garter spring designs and many more custom springs. Our online spring catalog has over 24,000 variations of spring designs from four different spring types which are: compression, extension, torsion, and tapered compression springs. Our stock spring catalog has different spring designs in different material types as well as plating options. The material types used on stock springs include Music Wire ASTM A227, Hard Drawn ASTM A228, Stainless Steel 302 ASTM A313, Stainless Steel 17-7 ASTM A313, Phosphor Bronze Grade A B159, and Beryllium Copper B197 ranging with wire diameters from 0.005” to over 1”. For custom springs we also offer Stainless Steel 316 ASTM A316 which is a great wire diameter used in medical applications due to its cleanliness. These and many more are some of the features and benefits you can get with Acxess Spring. Use Spring Creator to create your custom compression spring design or Spring Finder to find a stock spring similar to your design. Take these advanced spring design softwares with you on the go by visiting our website on your mobile devices or downloading the Spring Creator app on either the google play store or via the iOS app stores.